Attached Irony is a 42 page, 8.5x7 inch, artist catalog of sculptures with eighteen pages of artworks in color and a perfect bound, grey, textured cover. The forward is written by Julie Oakes and Rich Fog. 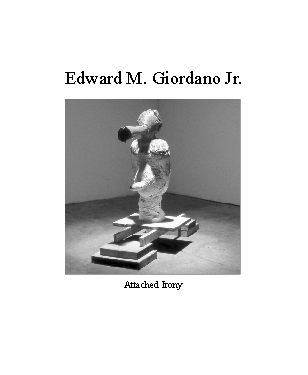 Attached Irony, Edward M. Giordano Jr. Sculptor: Edward M. Giordano Jr.